By Nemi Vora, participant of the IIASA Young Scientists Summer Program (YSSP) 2017 and PhD student at the University of Pittsburgh. 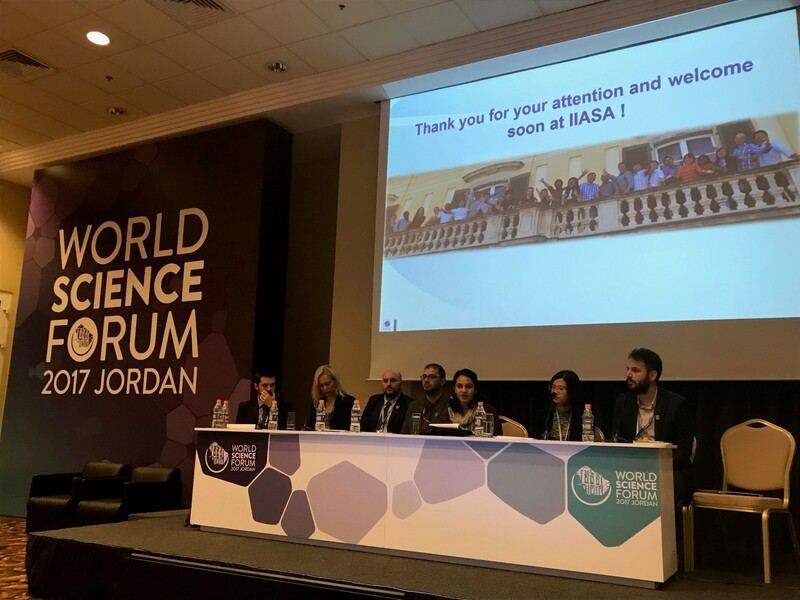 “Was it worth the flight?” asked my fellow alumna of the YSSP Karen Umansky, at the end of our first day of attending the World Science Forum in Jordan. The total journey from the USA to Jordan had taken 20 hours, layovers included. She was well aware of my travel anxiety, fear of immigration officials (an Indian passport doesn’t always make things easy), and fear of traveling alone on a militarized Dead Sea road at night (you can see the west bank on the other side). I had spammed her every day about it. I didn’t have an answer; the panels I attended did not focus on anything new. We were all aware of issues: digitization without destruction, women in science, support for emerging scientists, meeting the sustainable development goals, and so on. However, every conference has a different key to unlock its potential and Jan Marco Müller, head of the IIASA directorate office and another recipient of my daily email spam, informed me that it was not the panels, but the corridor conversations that mattered here. I soon found out that it was not just the corridors, but even the brief conversations in shuttles where the conference happened. I met a program manager for the US National Science Foundation who told me about research work on the food-energy-water nexus that they funded for the Nile, an area similar to my thesis. I met a regional director of UNESCO and a science minister from Colombia, who together set up new Africa-Latin America project partnerships during the shuttle ride. One important part of each conversation was the significance of the place I was in, something I had previously missed completely. The ability of this small country, surrounded by conflict zones on each side, to arrange for such a large gathering of this kind, bringing together opponents and allies alike, and to take a stand for enabling peace through science, was remarkable. True, the issues were not new, but the context was much more specific to the needs of a conflict-ridden world. For instance, discussing how to provide access to digital resources such as open data for policymaking or scientific journals for all the countries, promoting the achievements of Arab women scientists and those of the other developing regions amidst cultural and economic hardships, and fostering innovation in emerging scholars in the developing world where lack of resources was part of academic life. Jordan also showcased the recently established SESAME facility: the Middle East’s first international science research center, a joint venture of a group of middle eastern countries, otherwise engaged in political conflicts. IIASA was representing a unique position here: originally founded as the bridge between East-West scientific collaboration during the Cold War, it served as an example, along with the fledgling SESAME, that geo-political boundaries did not hinder science and that such projects could be successful. Despite political tensions in individual countries, and having a passport that would not allow you to visit your colleague’s country, you could still work side-by side—a feat that SESAME scientists achieve every day. As YSSPers, our goal was to talk about the benefits of global mentorship and how that could be leveraged to address the uneven distribution of resources. All of us came from different backgrounds: there was An Ha Truong from Vietnam, an energy economist studying optimization of biomass for coal power plants, there was Karen, the social scientist from Israel, studying emerging neo-Nazism in Europe, and then there was me—representing the USA and India as an environmental engineer. 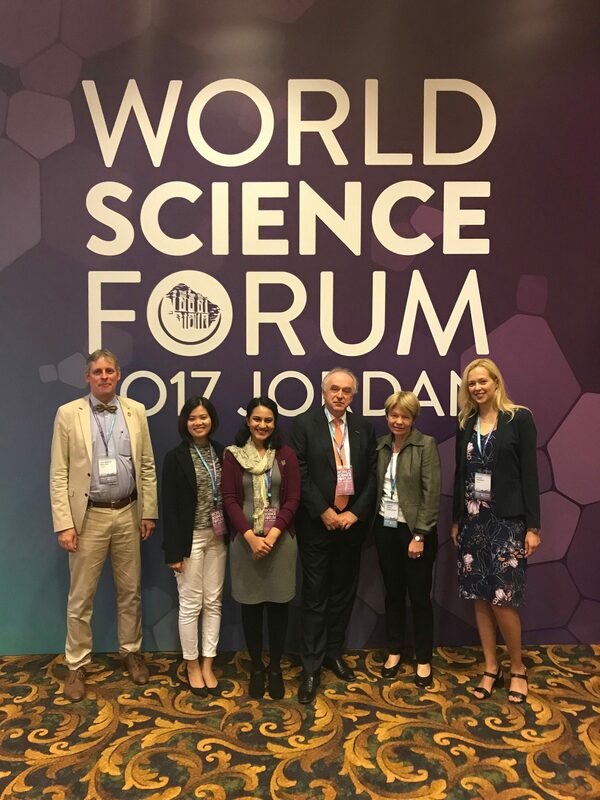 Our co-panelists from the Berkeley Global Science Institute, also of diverse backgrounds, were engaged in setting up labs across the world, providing resources and mentorship to graduate students. While we had a lively session discussing our personal experiences, it wasn’t what we had to say but the session questions that struck a chord with us. The presence of conflicts add another layer of complexity to the already murky path of academia: how do you keep young scholars motivated to stay in the lab and work in a country threatened by war? How do you compete in cutting-edge science research when resources are scarce? How do you engage in public-private partnerships when your work may be more theoretical than applied? We need to collaborate more, provide access to the data and codes we use to carry out reproducible research, attempt to publish in open access platforms whenever feasible, and support our fellow scientists irrespective of their location or positions. This way, we would inch closer to solving some of these issues. Six months ago at IIASA, the HRH Sumaya bint El Hassan, co-chair of the World Science Forum, had asked me, “How do you eat an elephant?” Being a vegetarian, I couldn’t imagine ever eating one and I very naively told her so. On my way back from Jordan, with another long journey ahead of me, I realized the significance of her words: you eat it little by little.